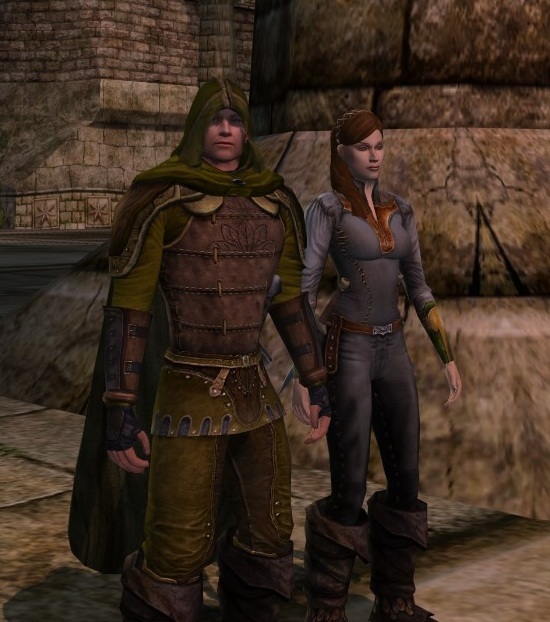 This is a special “Seen on the Streets” — Landroval player (and roleplayer) Enorra suggested her friend and in-character husband Faynir for a surprise post about his cosmetic looks. She praised Faynir’s efforts, which even include the use of rp weapons to complement his attire. 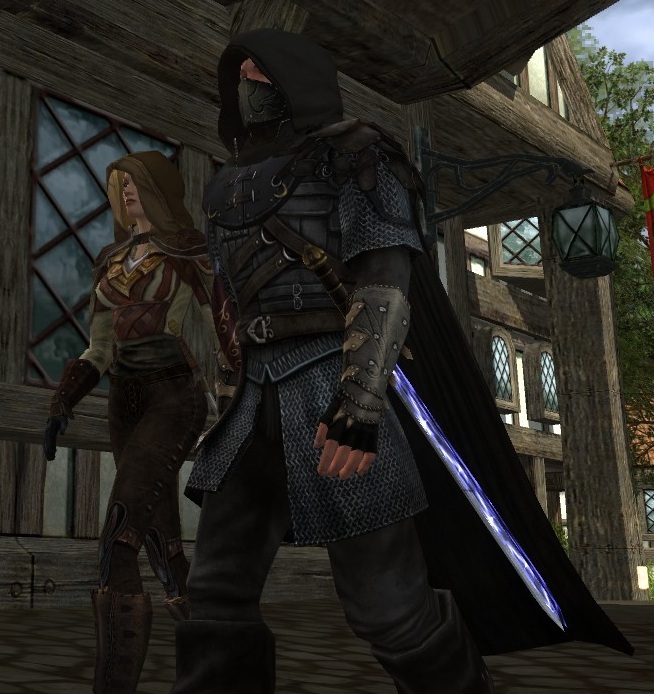 After a moment or two of stalking (“she’s looking at your outfits from INSIDE THE HOUSE”), I agreed: he has a number of Ranger-appropriate, dark, sleek looks that really encapsulate that aura of mystery and strength. Screenshots are courtesy of Enorra. To Faynir: Surpriiiiise! I think Faynir has done a great job with all of his outfits. They’re monochromatic, dark or dun colors, they’re imposing without sticking out — well done! Enorra and Faynir in town. 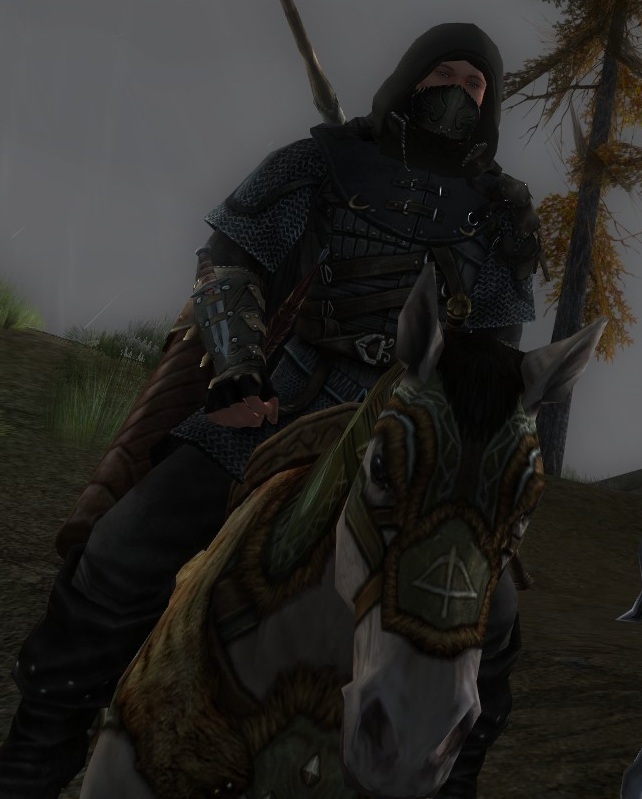 It’s a dark screenshot, but I love the rain and the idea of the Ranger (and his lady, who I had to crop out, sorrrrrry!) riding through the sloggy, muddy wilderness. And I never really noticed the dagger in those gauntlets before; great detail. If you have any questions about individual pieces, please leave a comment, and I’ll track down Enorra (or perhaps the Ranger himself!) to point you in the right direction. This was my thought as well… what is that top she’s wearing I wonder? I love the third picture of Faynir. So… ranger-ish! The dagger totally makes those gauntlets. They’re a dapper couple, that’s for sure! Wow! Those are some really cool outfits! I will poke them in-game and try to get some answers! Hope I am not committing a faux paux by linking to another blog, but this is useful for finding those quest reward items. Not a faux pas at all – whatever helps people find things is awesome. Thanks, Enorra!